Two local parents say an Apple Watch they got for her their daughter during Christmas saved her life. LITHIA, FL -- Two local parents say an Apple Watch they got for her their daughter during Christmas saved her life. Notifications about Deanna Recktenwald’s heart rate led to a hospital visit, just in time to pick up a major issue with her kidneys. Their experience has sparked a conversation about the benefits of the Apple Watch and other fitness tracking devices. “Had it not been for the watch that her heart rate was up, we would never have known there was a kidney issue, which she has been mainly treated for,” said Tom Recktenwald, her father. 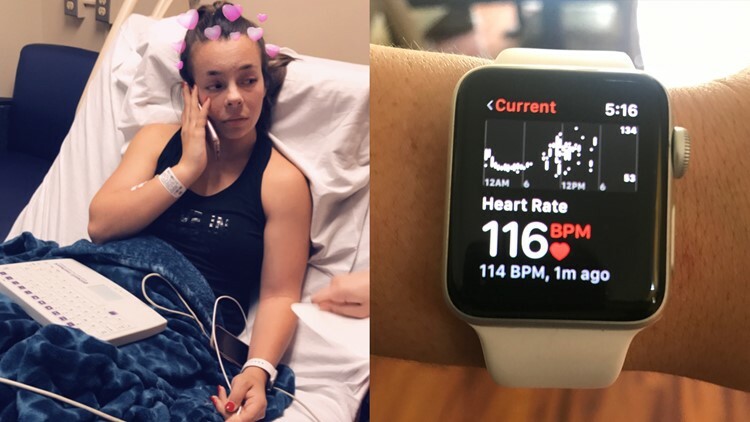 Deanna Recktenwald's Apple Watch alerted her to kidney failure. Deanna mostly used her watch for the time, social media and different apps, so it was a surprise. She was in church on April 22 when the watch told her she needed to seek medical attention immediately because of her heart rate. Her mom, who's a nurse, didn't trust the watch. But, she checked and found the device was correct. They went to urgent care and then the emergency room. It was just in time because Deanna was having kidney failure. “I’m getting better. Still have high heart rates and spikes here and there. I’m very grateful for the watch that it alarmed me and gave me advice to seek attention because it was so high,” she said. Reporter: Do you that the watch might’ve saved your life? A report from December by "Research-Scape International" found 51 percent of Americans wear some kind of fitness tracker at least once a day. Most of those people say they do it to count their steps. About 31 percent say they use fitness trackers to keep track of their heart rate. So, these are helpful devices, but they're not supposed to replace a regular visit to the doctor. Many of them are not federally-regulated health devices. “These types of technologies are additive to the practice of medicine and really support the physicians in providing extra data when they’re not in the healthcare setting,” said Dr. Peter Chang, chief medical informatics officer at Tampa General Hospital. But, of course, the only problem with these types of technologies is that not all of them are Food and Drug Administration approved. "So, you do kind of have to take the information with a grain of salt when you’re looking at it," Chang said.